August 26, 2011  How strong is Texas Gov. Rick Perry's attraction to supporters of the Tea Party? Here's one impressive measure. Perry has support from a higher percentage of Tea Party backers than Rep. Michele Bachmann and Mitt Romney combined, according to a Gallup poll. August 24, 2011  Mitt Romney signaled Wednesday that he doesn't see South Carolina as key to the presidential nomination. His campaign said he won't attend Sen. Jim DeMint's South Carolina Labor Day forum for presidential candidates. A Romney spokesman cited scheduling conflicts. By not attending the South Carolina event, Romney fuels speculation his strategy is to win without the Palmetto State. August 19, 2011  Mitt Romney appears to have a real primary fight ahead. Long suspected as being a Republican in Name Only by many of his party's hard-core conservatives, he's faced with two rivals — Rep. Michele Bachmann and Texas Gov. Rick Perry — with strong appeal to that key segment of the party. But Romney has some advantages. His main rivals appear poised to split voters. And they have been gaffe prone. Obama's Midwest Tour Continues; Rivals Focus On Iowa, N.H. And S.C.
August 16, 2011  While the president talks at a "rural economic forum," his Republican rivals will be on the campaign trail. August 15, 2011  Rep. Michele Bachmann and Texas Gov. Rick Perry were both in Waterloo, IA, Sunday night at the Black Hawk County Republican dinner and it sounds like they both left some Iowans impressed, others not quite.It sounds like Bachmann may have even hurt herself with some Iowans by sweeping into the room as though she were already president, according to a report in Politico.com. August 13, 2011  Rep. Michele Bachmann won the Iowa straw poll, but the presumptive frontrunner for the Republican presidential nomination and winner of the poll in 2007, Mitt Romney, didn't even compete. Texas Gov. Rick Perry, who also didn't compete in the poll, entered the race Saturday with polling numbers near Romney's before he even announced. August 13, 2011  Rep. Michele Bachmann topped all the Republican presidential candidates in the Ames Straw Poll in Iowa with 4,823 votes. The results are a victory for the Tea Party wing of the Republican Party and make former Minnesota Gov. Tim Pawlenty's way forward uncertain. August 13, 2011  Michele Bachmann, in contrast to Pawlenty's low-key delivery, took the stage, microphone in hand, stressed her Iowa roots, and pronounced the state the "pace car" of the 2012 election. For Tim Pawlenty, the speech was about who could win in 2012. 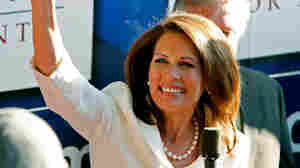 For Bachmann, it was about what judges she'd appoint when she's in the White House. 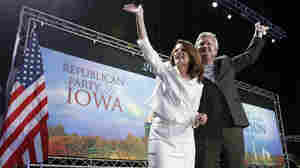 August 13, 2011  These sunny August days in Iowa prove to be Michele Bachmann's best as a GOP presidential candidate. On the eve of the state's Republican straw poll in Ames, where she is expected to either win or place, the Minnesota congresswoman hop-scotched central Iowa. August 11, 2011  In the Iowa debate, Mitt Romney, the frontrunner, will likely stick tightly on his message,which is that President Obama has failed to lead, and his approach, which is to play it safe. It's a traditional frontrunner's strategy against an incumbent president of the opposite party.